The Whirlwind Medusa Power Series is designed specifically for use with mixing boards that incorporate built-in power amplifiers. 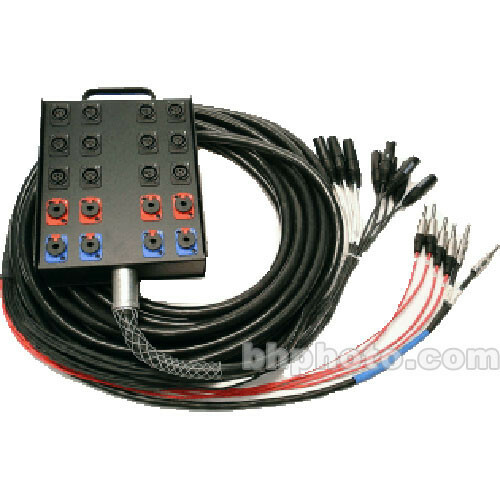 The Power Medusa is constructed of a heavy-duty steel stage box with twelve female XLR inputs, four 1/4" TRS returns, and four 1/4" speaker jacks. Whirlwind Power Series multipair cable is a cable within a cable - the outer layer contains audio pairs surrounding an inner core of 2 pairs of 14 gauge wire that has its own overall foil shield and jacket. Each of the two speaker lines is terminated with 2 paralleled 1/4" jacks on the box. A heavy-duty wire mesh strain relief secures the multipair cable to the box and a wire mesh hanger grip is provided at the fanout. Two mono return speaker lines which are terminated with 2 paralleled 1/4" jacks each on the box. Box Dimensions (LxWxH) 18.0 x 18.0 x 13.0"